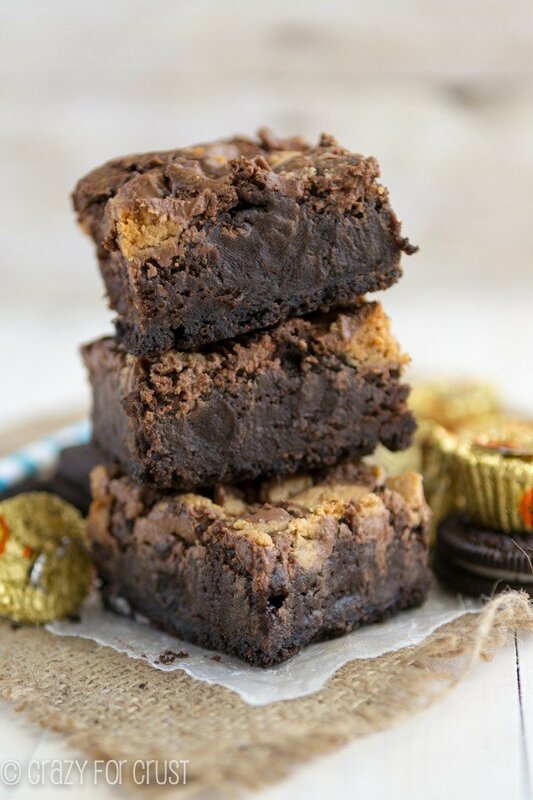 The ULTIMATE Reese’s Brownies! 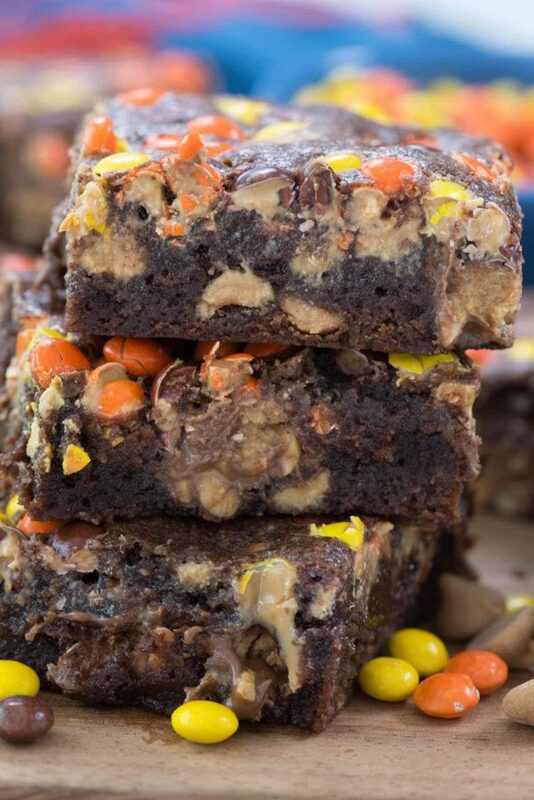 This is a one bowl brownie recipe FULL of 3 KINDS of Reese’s: peanut butter cups, peanut butter chips, and Reese’s Pieces!! The best brownie recipe for peanut butter lovers! Over the past few weeks we’ve had a new resident in our yard: a squirrel. For many years I didn’t think that squirrels even existed where we lived, because I never saw one. Then, about 6 months ago, I’d see one on the back fence every once in awhile. I was surprised because we’d lived in my city for 10 years and never seen a squirrel even once. Over the last two weeks the squirrel, who I’ve since named Steve, has taken up living on our back porch. I consistently hear him scratching under the back window and he’s taken to scurrying around on the back patio roof (which is right outside my bedroom window). The timing of Steve’s arrival is not lost on me; Ginger passed away 2 weeks ago and Steve the Squirrel moved in shortly thereafter. No dog = no one to scare him away. In fact, when I look back, I realize that we started seeing him on the back fence right around the time Ginger started slowing down, not running and chasing the birds and barking that everything that moved. I’m not quite sure how to squirrel-proof my back yard, but I’m willing to let Steve hang around until mid-August. I think he’ll move out quickly after that, because that’s when our new puppy will arrive. Until then, maybe I’ll leave Steve some of my Ultimate Reese’s Brownies to snack on? Or no? As usual, I overstuffed brownies with something fantastic. In the past, I’ve done it with chocolate or Oreos or I’ve shoved them in a pie crust to make an ultimate brownie pie. This time I started with my favorite brownie recipe and I shoved it FULL of all the Reese’s items I could find at the grocery store. 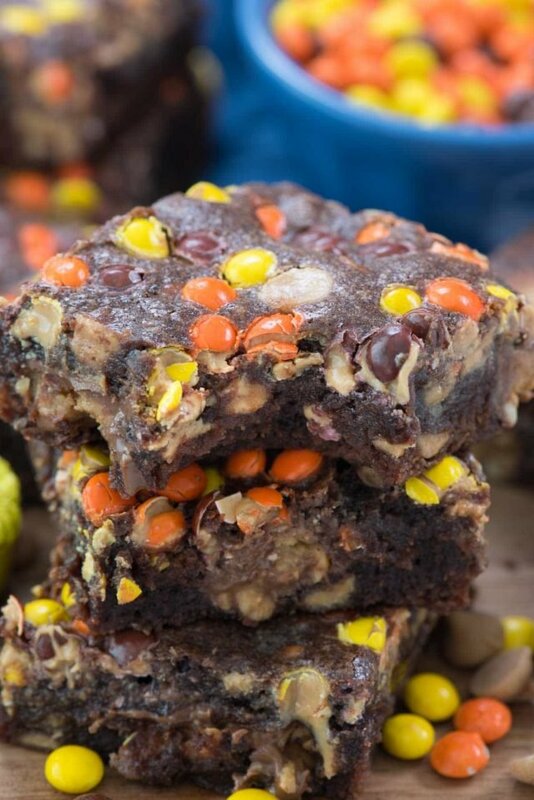 These peanut butter brownies have peanut butter chips inside (you can find them in the baking aisle), peanut butter cups in the middle, and Reese’s Pieces sprinkled on top. If you’ve a peanut butter and chocolate lover or you are as obsessed with Reese’s as I am, THESE Ultimate Reese’s Brownies are for you! These are SO good and they not only taste good warm but you can freeze them for later too. I made them ahead and froze them for a party and they tasted just as good as fresh. And EVERYONE loves them! 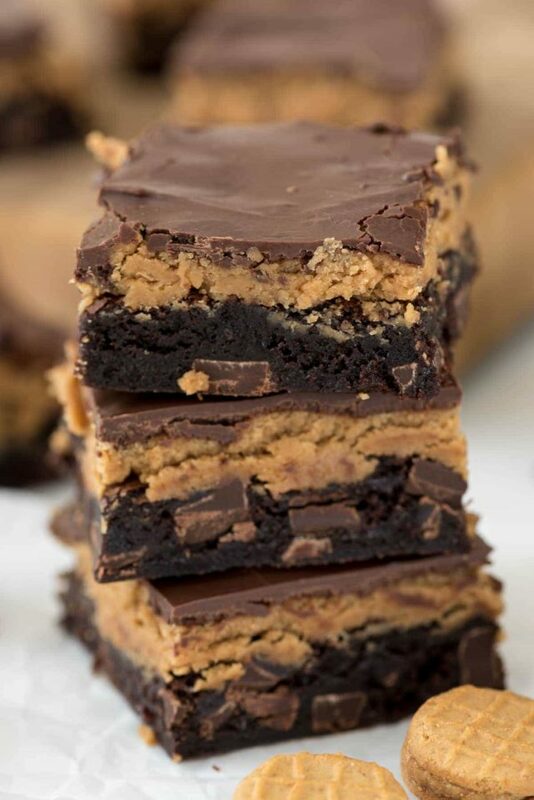 This is the ULTIMATE Reese's Brownie Recipe! It's a one bowl brownie recipe FULL of 3 KINDS of Reese's: peanut butter cups, peanut butter chips, and Reese's Pieces!! Whisk flour, cocoa, sugar, and salt in a large bowl. Stir in eggs and oil until completely mixed. Stir in the peanut butter chips. Spread half the batter in the prepared pan. Top with peanut butter cups (whole, or you can chop them if you prefer). Then top with the remaining batter and sprinkle the Reese’s Pieces over the top. Bake for 20-26 minutes or until they just stop jiggling a little. These are better under done than over done! Cool before slicing. If you looooove brownies as much as I do be sure to check out all my brownie recipes, my peanut butter recipes, and my Reese’s recipes! 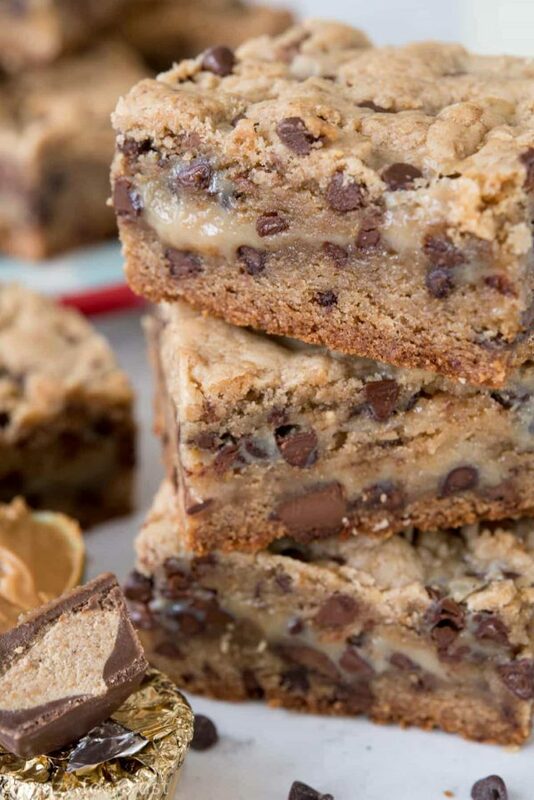 And check out these recipes from my friends: Reese’s Peanut Butter Cup Bark by Wine & Glue, Reese’s Peanut Butter Cup Bread Pudding by The Little Kitchen, or Reese’s Monster Cookies by Oh Sweet Basil. They are soooo gooey and fudgy and just wow! All those Reese’s products in every single bite. YUM! I am so excited for you guys and your new puppy in August!!!! Oh these look amazing!! My whole life revolves around chocolate and peanut butter – -lol! I am making this ASAP!! Totally drooling at the picture! I was wondering what to do with the half bag of peanut butter chips I have left! WOW…these look so good. Pinned! This looks like the best sugar high ever! These looks so yummy Could a person use applesauce in place of the vegetable oil??? Do you have to use a foil-lined pan? I took these brownies to several friends and they ALL loved them! My husband even ate THREE in one sitting. Thanks for sharing a great recipe!